Radiating our from the Venusian volcano Ozza Mons (red, center) are thousands of miles of rift zones (purple). Data from the Venus Express spacecraft suggests there are active lava flows in hotspots along the rifts. Planetary scientists know that volcanoes have crackled on the surface of Venus for much of the planet's history. Now, using data from the Venus Express spacecraft, an international team of researchers has found new evidence that some of those Venusian volcanoes may still be active today. PROVIDENCE, R.I. [Brown University] — An international team of scientists has found some of the best evidence yet that Venus, Earth’s nearest neighbor, is volcanically active. In combing through data from the European Space Agency’s Venus Express mission, the scientists found transient spikes in temperature at several spots on the planet’s surface. The hotspots, which were found to flash and fade over the course of just a few days, appear to be generated by active flows of lava on the surface. “We were able to show strong evidence that Venus is volcanically, and thus internally, active today,” said James W. Head, a geologist at Brown University and co-author of a paper describing the new research. “This is a major finding that helps us understand the evolution of planets like our own." The research is published online in Geophysical Research Letters. The hotspots turned up in thermal imaging taken by the Venus Express spacecraft’s Venus Monitoring Camera. The data showed spikes in temperature of several hundred degrees Fahrenheit in spots ranging in size from 1 square kilometer to over 200 kilometers. The spots were clustered in a large rift zone called Ganiki Chasma. Rift zones are formed by stretching of the crust by internal forces and hot magma that rises toward the surface. Head and Russian colleague Mikhail Ivanov had previously mapped the region as part of a global geologic map of Venus generated from the Soviet Venera missions in the 1980s and U.S. Magellan mission in the 1990s. The mapping work had shown that Ganiki Chasma was quite young, geologically speaking, but just how young wasn’t clear until now. The latest finding is consistent with other data from Venus Express that have hinted at very recent volcanic activity. In 2010, infrared imaging from several volcanoes seemed to indicate lava flows from thousands to a few million years old. A few years later, scientists reported transient spikes in sulfur dioxide in Venus’ upper atmosphere, another potential signal of active volcanism. 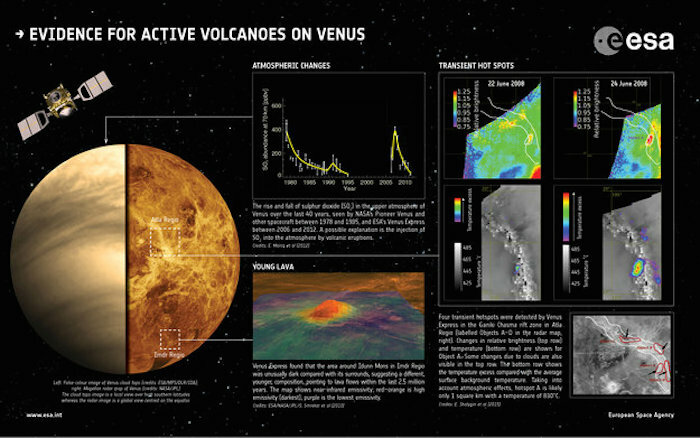 The observation of hotspots by Venus Express, combined with the geologic mapping from Venera and Magellan, make a strong case for a volcanically active Venus, Head says. The work was led by Eugene Shalygin and Wojciech Markiewicz of the Max Planck Institute. Additional co-authors were Alexander Basilevski (Russia’s Vernadsky Institute and Brown University), Dima Titov (European Space Agency) and N.I. Ignatiev (Russia’s Space Research Institute). ESA’s Venus Express has found the best evidence yet for active volcanism on Earth’s neighbour planet. Seeing the planet’s surface is extremely difficult due to its thick atmosphere, but radar observations by previous missions to Venus have revealed it as a world covered in volcanoes and ancient lava flows. Venus is almost exactly the same size as Earth and has a similar bulk composition, so is likely to have an internal heat source, perhaps due to radioactive heating. This heat has to escape somehow, and one possibility is that it does so in the form of volcanic eruptions. Some models of planetary evolution suggest that Venus was resurfaced in a cataclysmic flood of lava around half a billion years ago. But whether Venus is active today has remained a hot topic in planetary science. ESA’s Venus Express, which completed its eight-year study of the planet last year, conducted a range of observations at different wavelengths to address this important question. In a study published in 2010, scientists reported that the infrared radiation coming from three volcanic regions was different to that from the surrounding terrain. They interpreted this as coming from relatively fresh lava flows that had not yet experienced significant surface weathering. These flows were found to be less than 2.5 million years old, but the study could not establish whether there is still active volcanism on the planet. An additional piece of evidence was reported in 2012, showing a sharp rise in the sulphur dioxide content of the upper atmosphere in 2006–2007, followed by a gradual fall over the following five years. Although changes in wind patterns could have caused this, the more intriguing possibility is that episodes of volcanic activity were injecting vast amounts of sulphur dioxide into the upper atmosphere. Now, using a near-infrared channel of the spacecraft’s Venus Monitoring Camera (VMC) to map thermal emission from the surface through a transparent spectral window in the planet’s atmosphere, an international team of planetary scientists has spotted localised changes in surface brightness between images taken only a few days apart. 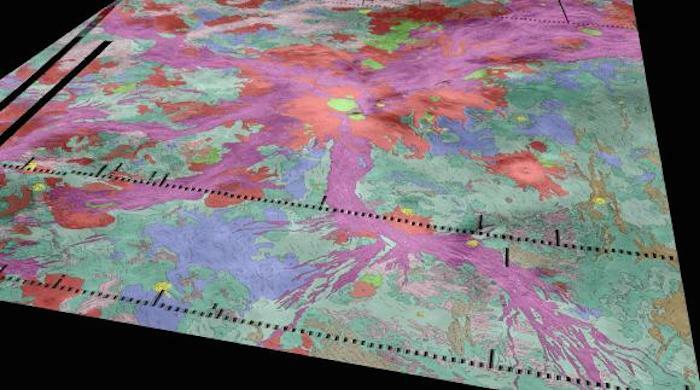 The Ganiki Chasma rift zone in Atla Regio on Venus was imaged repeatedly to look for changes. The maps presented here show changes in relative brightness compared to the average background (red-orange indicates an increase, blue-purple a decrease) for a number of images acquired on each date. While some changes are due to variations in cloud brightness, one fixed surface hot spot is inferred, labelled ‘Object A’, which shows an increase in brightness between 22 and 24 June 2008 followed by a decrease. “We have now seen several events where a spot on the surface suddenly gets much hotter, and then cools down again,” says Eugene Shalygin from the Max Planck Institute for Solar System Research (MPS) in Germany, and lead author of the paper reporting the results in Geophysical Research Letters this month. The hotspots are found along the Ganiki Chasma rift zone close to the volcanoes Ozza Mons and Maat Mons. Rift zones are results of fracturing of the surface, which is often associated with upwelling of magma below the crust. This process can bring hot material to the surface, where it may be released through fractures as a lava flow. Because VMC’s view is blurred by the clouds, the areas of increased emission appear spread out over large areas more than 100 km across, but the hot regions on the surface below are probably much smaller. Indeed, for the hotspot known as ‘Object A’, the team calculate that the feature may only be around 1 square kilometre in size, with a temperature of 830°C, much higher than the global average of 480°C. The Ganiki Chasma rift zone was already considered to be one of the most recently geologically active regions on the planet, and as the new analysis suggests, it is still active today. “It looks like we can finally include Venus in the small club of volcanically active Solar System bodies,” says Håkan Svedhem, ESA’s Venus Express project scientist.